The man behind the designs you will find on this website, Vesko, moved to the U.S. from Bulgaria where he started his career as an engraver. Nestled in the heart of numerous ancient civilizations, Bulgaria's old masters were influenced by the Thracians, Romans, and Byzantines, leading to a long tradition of exquisite work unlike anything else in the world. It is from this tradition that Vesko draws his designs, and his very inspiration for life. Educated at the National School of Applied Arts in Sofia, Bulgaria, Vesko was formally trained as a Goldsmith and Platinumsmith, with a focus in hand fabrication and engraving. From an early age, he was handcrafting his own style of jewelry, combining that modern education with centuries of influence from surrounding European traditions. Combining hand engravings with the original jewelry, he was making, Vesko developed a style all his own - bringing it with him eventually to the United States. Already a master of gold and platinum jewelry and engravings, after moving to the United States, Vesko studied the Artwork of Nimschke, Kornbrath, Lynton McKenzie and many other master engravers learning the art of firearms engraving and enhancing his skills with engraving on knives and firearms. 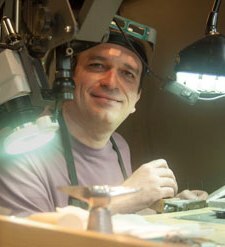 Using the American style of relief engraving on jewelry, combined with his many years of experience as a smith trained in the Bulgarian style, Vesko makes every piece he works on wholly unique - something to be treasured forever. It is this unique style that has made Vesko's work so inspirational. You can learn more about all of the different types of engraving Vesko can perform on this website, or you can contact him directly and ask to learn more about the services he offers for custom engraving for rings, wedding bands, Zippo lighters, belt buckles, knives, and firearms. Contact Veso Design today to learn more. With a love for his craft, Vesko started his career in the heart of a long and proud tradition of engraving in Bulgaria. Today he provides custom hand engraving to customers throughout the United States.